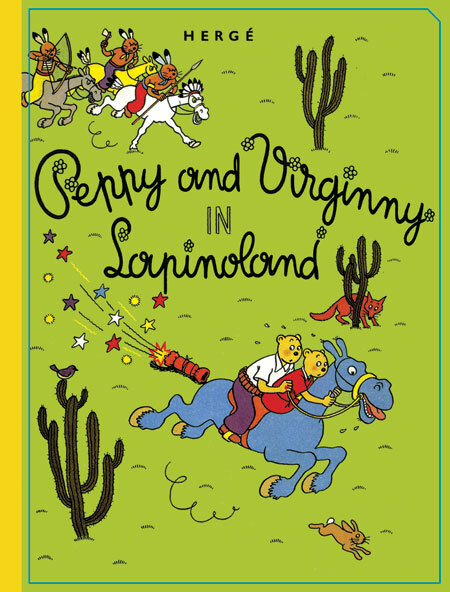 Great news for Herge fans: Fantagraphics will be reprinting his 1934 work Peppy and Virginny in Lapinoland- the first English language translation of the work in over 50 years: Tintin publishers Methuen previously released a version which was distributed in the UK in the 1960s. Due sometime next year, this will mark the first American publication of the book, which will be given the full colour, hardback treatment and is 56 pages in length. I'll admit to never having heard of this before, but like many people, I'm a huge Tintin and Herge buff, so really very excited about this news. Peppy and Virginny, our protagonists and haberdashers, seek out new clientele in the Wild West with the aid of their horse, Bluebell. The pair have multiple run-ins with evil bandits, Indian tribes and much more as engaging funny-animal characters (rabbits and bulldogs and bears, oh my!). Hergé's clear line drawing style of the earliest vintage Tintin albums takes a walk on the farcical side that is hilarious and all-ages (as long as you explain the non-PC 1930s use of the word "Injuns").